The following is A Small American City Q&A with Mark Nickita, president of Archive DS, a design firm specializing in projects and strategies for city building in Detroit and Toronto. Nickita is a city commissioner and has served as mayor of Birmingham, Michigan. 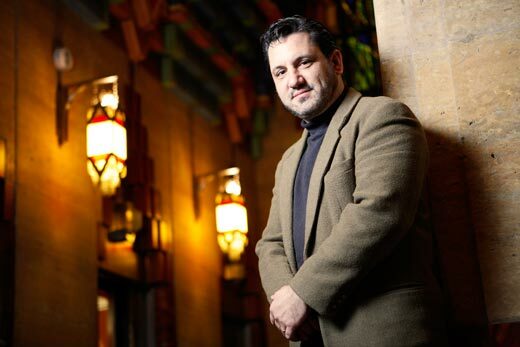 He is co-owner of retail establishments in Downtown Detroit, including the Pure Detroit Stores, The Rowland Cafe and Stella International Cafes. Duncan Crary: You recently toured downtown Troy after leading a session in Schenectady at the Congress for the New Urbanism, New York Chapter. What brought you to our small American City? Mark Nickita: Well, after hearing a lot about it from you and Jim K (James Howard Kunstler), we were intrigued by the historic small city that is in the process of reinventing itself. Also, I am writing a book about the Great Lakes Region, often called the Rust Belt, which I redefine as The Lake Belt. As part of my research, I am going to as many Lake Belt connected cities as I can to understand their history, past successes and current assets that will drive them into a new, and hopefully, prosperous future. DC: What parts of town did you visit? Nickita: We mainly toured the downtown area and a bit along the Hudson River. We drove around and did an overview, then did a walking tour specifically within the downtown district. DC: And what were your impressions of the urban fabric, the architecture, the life of the street? Nickita: We were mainly in the city during the later evening hours, so I would say that the street life was largely related to people going to restaurants and cafes/bars for entertainment. It seems quite active with outdoor cafes seating and people walking around. The core is blessed with terrific urban fabric and architecture. As an urbanist, I look to connect the quality of the street space with the scale of the built form. That was right on. One of the most impressive things about downtown is the width of the street and the height of the buildings. It is very well proportioned to create a great urban condition for the pedestrian. The quality of the architecture is strong as well. Even though Troy is a small city, it has the feel of being in a district of a large city, like Greenwich Village in New York City or the North End in Boston. Even though Troy is a small city, it has the feel of being in a district of a large city, like Greenwich Village in New York City or the North End in Boston. DC: Did you have trouble finding parking? DC: The idea of turning portions of our downtown into permanent pedestrian-only streets comes up a lot in our city. And, though I don’t have a car (I’m somewhat “anti-car”), I always find myself in opposition to the idea of eliminating car traffic on certain streets, which seems contrarian. What lessons have the New Urbanists learned about pedestrian-only streets, especially in small cities like Troy? Nickita: In North America, the concept of closing streets for pedestrianization is commonly explored and has even been attempted in many places. In almost every case, they have failed. There are exceptions, but few. Many people go to Europe or Asia and see these places without cars and come home encouraging their communities to do the same. I believe that this can work when the right amount of density and mixed activity is in place. Places like Times Square in New York City have found success by doing this, but few places are like that. New York City in general is an anomaly in itself. I prefer to look at ways that we can integrate the automobile so that it that allows for a pedestrian-oriented focus. That is to say that we can make our cities and streets with a different set of priorities than we have in recent decades. Design for people first, then bikes, transit and finally cars. All modes of travel can be accommodated with an appropriate result, if done carefully. We use the term “Complete Streets,” which is to say that the design considers all elements of built form and use. If done correctly, streets can be quite pleasant and fully functional. As an example, cities in The Netherlands do this very well. Nickita: A parking strategy is important as a way to achieve the required vehicular support moving into the future. Surface parking lots should be avoided at all costs — they are directly detrimental to a healthy and successful urban environment. Fill in the ones that you have and avoid creating any more. As for filling the demand for current and future parking requirements, thoughtfully positioned (parking) decks should be integrated into the downtown. Spaced apart and within short distances of most of the downtown area. These decks should be mixed use, where they function as a parking use with retail/commercial/office space on the street level and some other use, retail or office, above. That is the ideal type of parking for a great urban environment — other than underground, if that is financially achievable. In North America, the concept of closing streets for pedestrianization is commonly explored and has even been attempted in many places. In almost every case, they have failed. DC: You also visited the downtowns of Albany, Schenectady and Saratoga. Did any differences strike you about these four small cities of the “Capital Region”? Do you have any impressions about how these places could be better linked to each other? Nickita: All cities have their unique characteristics, positive and negative. Of the four, I found Troy to have the most intact, dense and high quality downtown urban fabric. There are many interesting elements to each. Saratoga is a vibrant city with many strong points, but the downtown is a bit lower scale and has a small town feel. Troy feels more like a city district in comparison. In general, moving forward, cities need to work more collectively than in the past. Especially small towns, the synergy of multiple towns and cities working together has far more potential that one on its own — even if it has a certain level of success. Obviously these four cities are connected by highway, but historically they were connected by water and rail. I think that a focus should be put on ways that cities and towns can work together as a unit, and provide multiple alternatives to be integrated. This can be done with a transit, rail/bus/bus rapid transit options and with bike paths as well. The more these towns can become unified and share their assets and amenities, the stronger the greater region will become. DC: Are there any lessons from Detroit that would benefit Troy? Nickita: Yes. Build on your assets. As a 312 year old city, and one with a series of significant historical booms, Detroit has incredible assets. That is what is happening now, the focus, enhancement and leveraging of them to provide an environment that people want. That is the message of the Lake Belt Cities, large and small, healthy or challenged. These cities have amazing “bones” and strong elements that support pedestrian activity and feel. This is where the trends are all leading – people want to be connected to good urban form. To live, work and play. Cities like Troy, Detroit and so many others have much to build upon, the foundation is already there. Newer cities and suburbs, built mostly in post-WWII times, dream about having these fundamentals, and are finding it nearly impossible to achieve it. Duncan Crary is host and producer of “A Small American City” podcast. He is the author of The KunstlerCast: Conversations with James Howard Kunstler…the tragic comedy of suburban sprawl (New Society Publishers, 2011).